RANGO is a revelation. It is one of the best films I have seen this year, one of the best animated films since TOY STORY, and must surely raise the bar in terms of what is seen as appropriate material for a children's film, and the level of ambition one can bring to the visuals in an animated film. I wonder if history will judge it as revolutionary as AVATAR in terms of bringing the craft of cinema forward and - contra AVATAR - showing us just how dazzling and immersive visuals can be without 3D, but when the CGI animators are guided by one of the best cinematographers working today, Roger Deakins (TRUE GRIT, NO COUNTRY FOR OLD MEN). The movie has been put together by the team behind PIRATES OF THE CARIBBEAN - director Gore Verbinski and star Johnny Depp - and it's their best film to date - capturing the sheer energy and comedy of the original POTC film, but allying it to a stronger story and imbuing it with an indulgent love of cinema. For this is, above everything, a film for cineastes - a film about the joy of transformation - of being part of a story that you craft - and about living up to the Heroic Ideal. To that end, John Logan (GLADIATOR)'s screenplay leans heavily on the plot of 70s film noir, CHINATOWN, but lives in the shadow of all of those wonderful Clint Eastwood westerns, not to mention doffing its cap to FEAR AND LOATHING IN LAS VEGAS, IT'S A WONDERFUL LIFE and APOCALYPSE NOW among others. Johnny Depp plays a pet lizard with no real friends but a vivid imagination. The lizard is the ultimate cinephile, indulging in wild cine-literate fantasies, but ultimately lonely and confused about who he really is. When a car accident leaves him wondering into a old western town in the Mojave desert, he takes the opportunity to reinvent himself as "Rango" - a gun-slinging hero along the lines of The Man With No Name. And boy does this town need a Hero. Some Evil man (obvious to anyone who's seen CHINATOWN) has been hoarding water, leaving the town to run dry, forcing humble farmers from their land....In order to sort this mess out, Rango has to over-come his fear, make good friends, and become a Real Hero, helped out by a wise armadillo (Al Molina) and a surreal dream featuring Timothy Olyphant as the Clint-like Spirit of the West. What I love about Rango is its evident love for the genres it's referring to (in sharp contrast to the risible YOUR HIGHNESS) and its evident love for the textures of the western. I've never seen an animated film - typically full of shiny, bright, smooth CGI - look so dusty, weather-beaten and worn. The details of the fur, the clothes, the buildings is quite stunning and the film is drawn as if it really has been shot on old fashioned 35mm by the best cinematographer in the business. Add to that a story with real stakes and real emotional heart, voiced by actors at the top of their game. (Special mentions for Isla Fisher as Beans and Ned Beatty as the Mayor.) But most of all I love that this film neither patronises its young audience nor bores its adult audience - and yet doesn't pander to quick, cheap laughs with post-modern winks at popular culture - a trait I particularly detest in the SHREK films. Which other animated movie would dare to have a joke in which the word "thespians" is confused for "lesbians" - or a sequence in which the Hero cross-dresses? 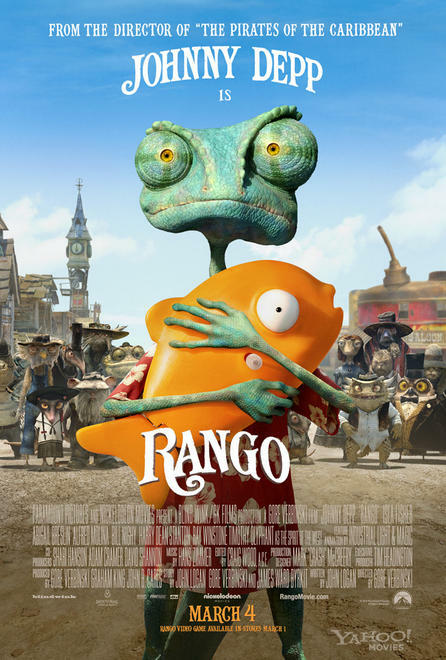 All of this makes RANGO at once marvellously old-fashioned in its cinephilia, its textures and its wonderful photography, but also marvellously modern in its subversive adult humour and willingness to use surreal dream sequences. This really is a wonderful film - and one can only hope that other animated features rise to the challenge of matching its attention to detail and depth of vision. 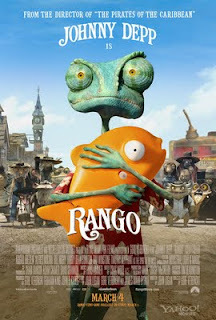 RANGO is on global release in all bar Japan where it opens on September 23rd. What a wonderful review! This is also my pick for Best Film of 2011 to date. I was blown away by the visuals! WIth you right down to every comma, every period. Rango is a little masterpiece that totally shook me with the vision, the whole Western-revisit via animation, then the exquisite lighting and design and finally the devastatingly brilliant writing. Priceless one liners, great characters, such thematic density... seriously no praise is enough for this fable-for-adults. I thought Train Your Dragon last year took things forward a bit for the rapidly turning-vacuous genre of CGI animation, but Rango is a bloody game-changer. To quote Iphone 4's tagline: this changes everything. again.